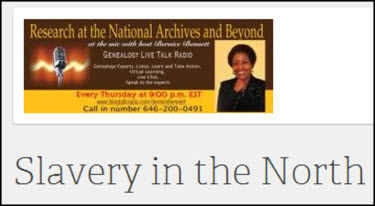 Tomorrow night, Thursday, April 10, at 9 p.m. EDT, Bernice Bennett, host of BlogTalkRadio’s Research at the National Archives & Beyond, and The Legal Genealogist join forces for Slavery in the North. This free one-hour online radio program focuses on a fact that most genealogists tend to forget: that slavery wasn’t a southern issue only. The truth was that slavery existed for decades in northern states as well. And freedom didn’t come easy — the law often provided for only for gradual manumission, and freedmen themselves were often unwelcome in the north. While economic conditions and the different climate and agricultural base in the north meant that slavery was never as big a force in the north as it was in the south, there are still decades — generations — worth of records of value to both descendants of slaves and descendants of slaveholders in the north. From the first slave law in British North America to the persistence of forced “apprenticeships” well into the middle of the 19th century. from the Northwest Ordinance to the 13th amendment, come learn more about America’s “peculiar institution” and its lingering effects north of the Mason-Dixon line. This internet-based broadcast — Slavery in the North — is free to all. You don’t need to register, you don’t need any special hardware or software: just tune in and we’ll get underway at 9 p.m. EDT / 8 p.m. CDT / 7 p.m. MDT / 6 p.m. PDT. If you can’t join us live, you’re still in luck: all of the Research at the National Archives & Beyond programs are recorded so you can listen in on your own schedule. But if your schedule allows, we’ll welcome your comments and questions live, on the air. Hope we’ll “see” you tomorrow night.